Two weeks into 2018 and I am way ahead on my reading, which allows me to mix things up a bit. Such as, Astrophysics for People in a Hurry isn’t the second book I read this year, I don’t want to write about the others right now. I suppose if the two of you reading this are into spoilers you could go over to my Goodreads page and see where I’m at and what I’m up to, but there’s really no fun in that. I don’t have much to say about Astrophysics. It was fine and interesting and I’m a fan of Neil Degrasse Tyson and I liked that I could hear him when I read the book, but there’s a lot in the book and while he keeps it as light as astrophysics can be, I suppose, it’s still pretty heavy. There are a few recent discoveries and progress within the field that are interesting. There was also a lot of stuff that I already knew from reading A Brief History of Time and from taking an astronomy course back in undergrad because I needed science credits for my humanities degree so that I would graduate a well rounded individual. Jury’s out. I decided mostly consciously that this year I would not make resolution but rather I would set goals and in spite of that I resolved to try to be a little bit more social with my running, beyond a head nod or flashing the victory at passing Seawallers. So this morning I woke up earlier than a typical Sunday and jogged down to Vancouver Running Co for The Nation Run — a 5, 10, or 15 K social run. And I remembered why I don’t really like social runs. It was set to start at 9:30 a.m. and I timed my 2.5 K transit badly, arriving a bit too early (about 9:20), then stood around for about 20 minutes waiting for it to start. The hundred or so of us set off back over the Burrard Bridge for a photo opp at the inuksuk between Sunset Beach and English Bay. Then wait for everyone to arrive, then take some photos, then the 5s 10s and 15s set off for the remainder of our respective runs. 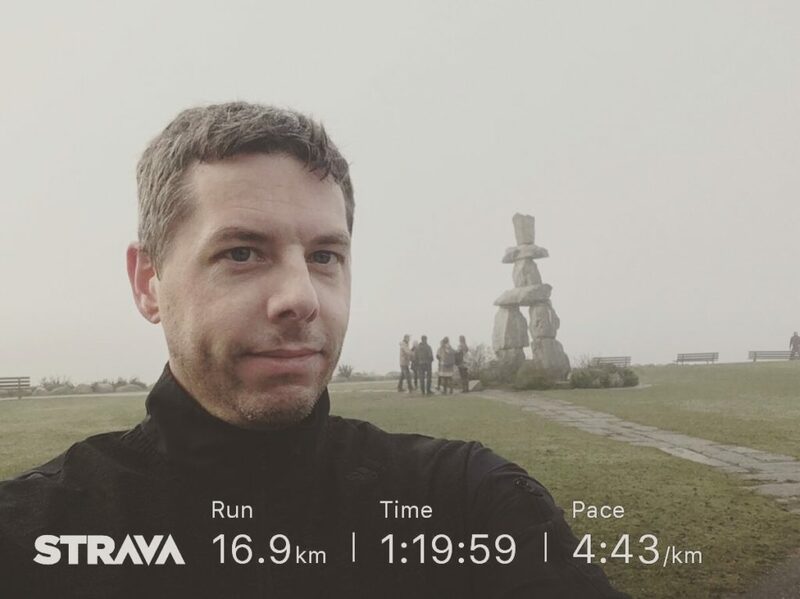 I went with the 15s — off around Second Beach Pool then the Seawall around Science World and back to Vancouver Running Co and I was with the lead group up until the Seawall detour just past the south end of the Cambie Bridge and then I started to gas and lost them around Granville. I paused in the fog at the corner of West 1st and Creekside, looked left and decided to go to right. The route went left. I went under Burrard and through Vanier Park past the Vancouver Museum and up Whyte back to the store. My 15 K that was actually mapped as 14.7 ended up being 16.9 and then another 2.5 to get back home, which turned my day into a surprise 22 K. I wasn’t planning on that. But it was fun. I even talked to a couple people. No wonder I’m so tired.